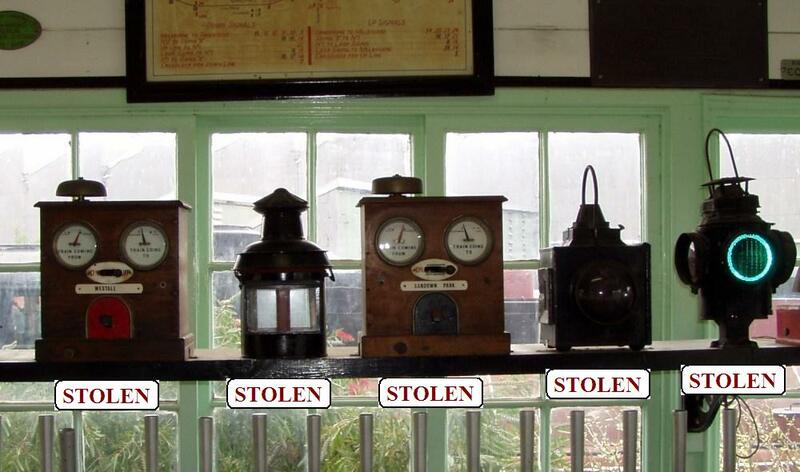 The ARHS Railway Museum at North Williamstown, Victoria was broken into and a number of rare items were stolen during a forced entry to the signal box. We believe it is possible that those responsible may try to sell them. From the manner in which these objects were selected and removed, it is evident that the thieves were aware of the significance and value of the objects. As they are both bulky and heavy, it is unlikely that they can be transmitted to buyers by post. The Police were notified on Saturday 18th December, 2010. We do not want you to expose yourselves to any risk, or to alert the thieves that we are on the lookout, we would certainly encourage you to discretely try to discover the identity of the people responsible and pass it advise us. A telephone number, email address may be all we need for the police to identify the culprits. Contact an Jenkin, Vice President,Australian Railway Historical Society Victorian Division Inc.
55 Text and photos Copyright © 2006-2019 SMEX, All rights reserved.